Today is 十五夜 Jugoya, the day for お月見 Otsukimi, or moon viewing. Essentially a harvest festival, it takes place on the 15th day of the eighth month of the old solar calendar. It happens to line up with the Chinese Autumn festival as well as the Korean Thanksgiving, Chuseok. In Japan we traditionally eat Tsukimi Dango, cute little mochi dumplings, and decorate with pampas grass while enjoying the beautiful full moon. Here’s a cute wallpaper of Gunma-chan set up with his grass and dumplings, just perfect for watching the rabbits in the moon making mochi (as they do.) By the way, today is apparently the Super Moon, so it should be lovely for gazing at while nibbling on dango–or moon cakes! Even McDonald’s gets in on the act here with special Moon Viewing Burgers that have a fried egg on them. This year’s version even has mushrooms! Would you eat it? 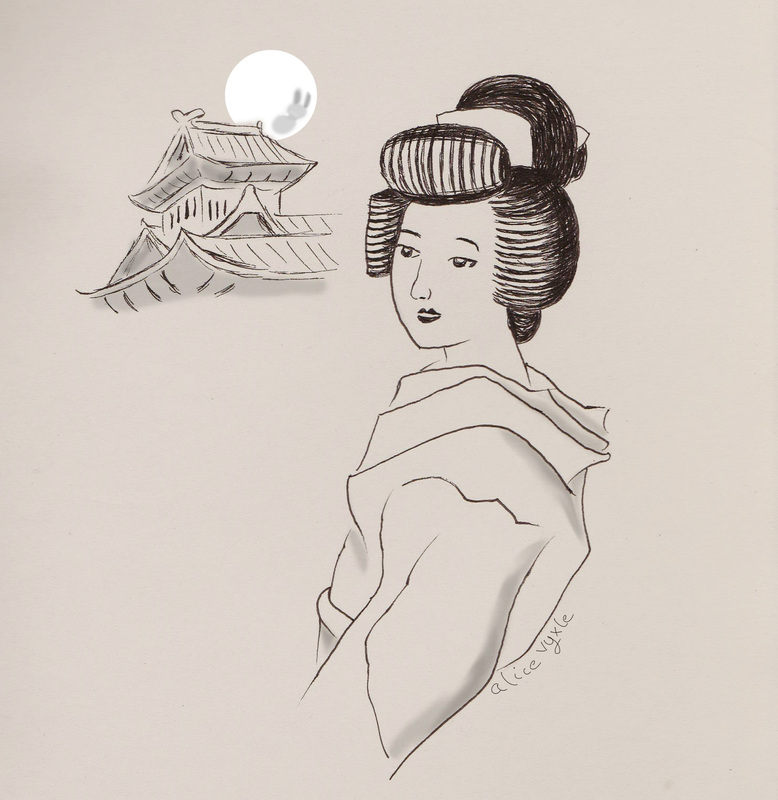 To celebrate this holiday I did this simple pen drawing of a traditional lady watching the moon behind a castle. The design is based on the box for one of my favorite treats from Sendai, 萩の月 or Hagi no Tsuki. Shaped like a moon, these are lovely little sponge cakes filled with custard. It’s always a good day when one of these shows up on my desk, a sure sign that a coworker has just come back from Miyagi Prefecture! This entry was posted in Uncategorized and tagged Art, お月見, chuseok, dango, 萩, 萩の月, Gunma chan, hagi no tsuki, 추석, Japan, Japanese, kimono, miyagi, moon, moon viewing, sendai, tsukimi, 宮城, 月見, 月見団子, 仙台. Bookmark the permalink. What a lovely drawing! I do enjoy all the moon viewing accessories that they have here, though I am not a big fan of egg on my burger. You should go to Sendai, it is a lovely city!